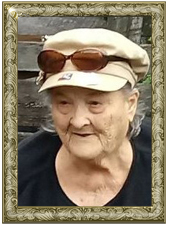 Ms. Ellen Ruth Young, 81, of Elkin, passed away on Thursday, October 19, 2018 at her home. Ellen was born on May 3, 1937 in Palm Beach County, Florida to the late Allen E. Young and Ruth Olive Burton Young. Ellen is preceded in death her parents; son, Jonathan Robert Dukes Jr.; sisters, Mazie Young and Betty Utz. Ellen is survived by her daughters, Vivian Rhoades, Debbie Dukes; brother, Paul Young, 10 grandchildren, 24 great grandchildren and 1 great great grand child.